Mama Steph here with a review! This was my FIRST box subscription delivery of any kind. Citrus Lane did NOT fail me! Tuesday, I received tracking information in a bright colored email. And,YESTERDAY this beautiful box of goodies for baby arrived! The Citrus Lane box was packaged well, easy to open and all items were wrapped in yellow tissue paper! It felt like Christmas, seriously! Here is my photo of the awesome box! Below are details. Tiny Love Harry Hippo Stroller Toy valued at $7.99, can clip on LOTS of items! On-the-Go Baby Laundry Detergent, 2 packages valued at $1.99, taking these to Grandma's house! 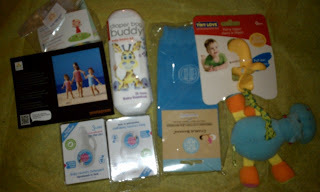 I just love Dapple baby--they make great products! Me4Kidz Diaper Bag Buddy valued at $5.95, this kit will stay in my car for accidents and issues. Great idea and super compact for those that want to keep them in your diaper bag! Sincerely Inc--10 Free Postagrams (sample postagram in black in my photo) valued at $10, SUPER easy to use--you can even upload from your phone! Excited to share these with friends and family! and start your subscription! It's just $25/month and they base YOUR box off your child's age and gender--all the way up to 3 years old! Use code SPRINGFUN. You can save $7.50 on three months, $12.50 on six months or $25 on 12 months! Looks like the best deal is doing a longer rem deal .What item did you like best?